There have been only two chief ministers in the recent past who could speak for all departments of their state in meetings with the Finance Commission, recount senior bureaucrats - former chief minister of Bihar, Lalu Prasad Yadav, and Narendra Damodardas Modi, former chief minister of Gujarat and now prime minister. "Modi in particular remembered everything about every department. He articulated their issues much better than the head of the department concerned, including state ministers," says a former member of the 11th and 12th Finance Commissions. Not surprisingly then, the prime minister is closely tracking the Budget-making exercise this year. Indeed, this Budget season, New Delhi wears a different look with its dramatically altered power centres. The frenzy of Budget accounting and planning is now divided between North Block (which houses the finance ministry) and South Block (where the Prime Minister's Office is located) on Raisina Hill, which offers a panoramic view of Lutyens' Delhi. Recommendations and suggestions have been sought from industry groups and economists. The minutes of the pre-Budget meetings between Finance Minister Arun Jaitley and various groups, being held at North Block, are being diligently forwarded to the PMO. The hands-on approach by the PMO has meant that ministers traditionally deeply involved in Budget making are free to travel on official engagements, while bureaucrats have been told to postpone all trips and information is being made available to them on a need-to-know-basis. 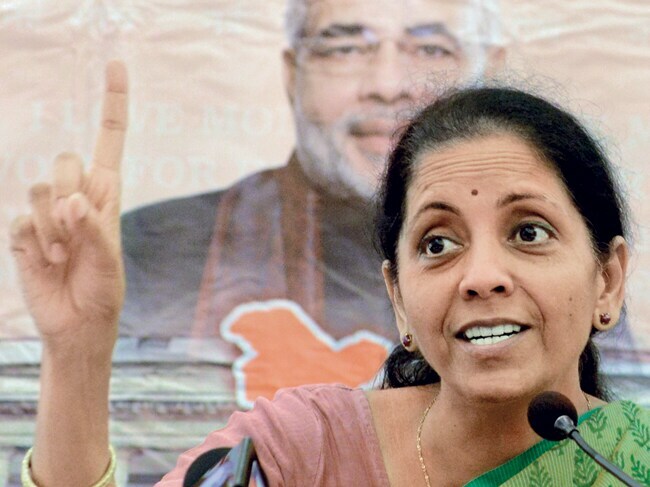 A case-in-point is the Minister of State for Finance, Nirmala Sitharaman, travelling to China while the Budget-making exercise was on in full swing. Budget 2014 will perhaps be the most challenging task the Modi-led government will undertake this financial year. Most investors have been waiting for the new government to lay down an economic roadmap for the country. Clearly, the government is faced with the gigantic task of kick-starting the economy. Factory output slipped into negative territory in 2013/14, subsidies have soared in the past 10 years and the fiscal deficit is high at 4.5 per cent of gross domestic product (GDP). In the interim Budget in February, the then finance minister P. Chidambaram had optimistically set a fiscal deficit target of 4.1 per cent for 2014/15. But economists feel Chidambaram might have underestimated the fiscal deficit by a percentage point. "We think there could be 20 per cent rationalisation of subsidies across the board which would result in savings of around Rs 50,000 crore. I know that 20 per cent is high but this is a year of possibilities," says Chandrajit Banerjee, Director General of the Confederation of Indian Industry. He has 'realistic expectations' from the government. The list of demands by industry associations is long but there is recognition that the government is severely constricted fiscally. From a fiscal point of view, it is evident that some tough measures will be required for India to get back to the roadmap laid down by the Fiscal Responsibility and Budget Management Act (FRBM). The United Progressive Alliance (UPA) government had shown blatant disregard for the FRBM guidelines that required the fiscal deficit to be capped at three per cent of GDP by 2008/09 and eliminating the revenue deficit, which currently hovers around three per cent. "During the 2008 crisis, India could not calibrate what it was doing. Other countries were cleverer, but India announced a stimulus without any limit. On the fiscal side, farm loan waivers were announced and spending on the rural job guarantee programme nearly doubled. On the monetary side, the repo rate was slashed from 8.75 per cent to 4.25 per cent within seven months," says an economist on condition of anonymity. Fiscal consolidation will be at the core of this Budget and the government will have to come up with a medium-term fiscal plan, he adds. What could this fiscal consolidation plan entail? Modi has already emphasised the need to take tough steps. The rail fare hike, a fiscally prudent and unpopular move, is a step in that direction. This could be followed by increasing some of the remaining administered prices of fuels - diesel, kerosene and cooking gas. There would be a concerted attempt for better targeting of subsidies to reduce them to about one per cent of GDP from about 2.5 per cent now. But there is unlikely to be any explicit announcement in this regard in the Budget. The unanimous consensus among economists is that decontrolling fuel pricing will have to happen for fiscal consolidation. The Independent Evaluation Office, an IMF department, has recommended scrapping of the Planning Commission, its redundancy highlighted by its non-involvement in the Budget-making exercise. A recast of the role of the commission could very well be on the agenda, which would involve more direct transfers to states. States have an average capital surplus of nearly 1.7 per cent of GDP parked with the Reserve Bank of India in cash and government securities. Inducing states to spend on capital expenditure could form the cornerstone of Modi's fiscal federalism stance that he has articulated on several occasions. Considering that the Centre's own finances are in a mess and the need to increase spends on capital expenditure is paramount, this could be one of the few options available. Others include an increased focus on disinvestment. A Securities and Exchange Board of India directive, issued weeks before the Budget, asks for a minimum 25 per cent public holding in all listed PSUs. "This year they should target Rs 100,000 crore through disinvestment ," says a senior economist. Poor Monsoon: Drought-like situation in June and scanty rainfall in the next three months could increase inflation. Foreign direct investment (FDI) could be another option to raise capital, but there are growing voices of dissent on how much and in which sectors. RSS leaders told Business Today that in several informal discussions with the finance minister they have shared their concerns over FDI in defence and manufacturing. The government is considering increasing the FDI cap in the defence sector to 49 per cent from the existing 26 per cent, and, in certain cases, to 51 per cent. Meanwhile, to deliver on its tall agenda of introducing bullet trains and building information highways and smart cities, the government will look at a combination of public-private partnerships and FDI. Top bureaucrats indicate that a Memorandum of Understanding (MoU) with the Japanese government is expected during Modi's visit to Japan after the Budget. "Japanese banks are also ready to finance but the finer details will be finalised after the Budget," says a bureaucrat. "Investors today have a positive attitude towards India as a destination, but people are keeping their fingers crossed. The Budget would be a key event to know which way the government is moving," says Tim Lisevich, MD of Canada-based BMO Capital Markets. Retrospective tax amendments of Section 9 of the Income Tax Act, announced by former finance minister and current President Pranab Mukherjee in the 2012 Budget, continue to haunt investors. Representatives from Nokia and Vodafone met Finance Minister Jaitley, seeking clarity on the issue. Section 9 of the Income Tax Act deals with tax on offshore mergers and acquisitions with assets in India. It is likely to continue, but may only be applicable prospectively. 'Ending Tax Terrorism', a promise made by Modi in his election speeches, will be top priority for the government that seeks to enhance ease of doing business in India. The finance minister might come out with an amnesty scheme to end the several tax dispute cases at the tribunal level. It will encourage assessees to voluntarily come forward and pay their tax dues. In return, there is likely to be a waiver of interest and penalty/prosecution. "If you go by data, most decisions in these tax disputes come in five to seven years. Recently the CAG (Comptroller and Auditor General) did a study and found that the government only wins 20 per cent of such cases. This means there is some problem in these tax demands," says Vivek Mishra, Leader, Tax Practice, at PwC India. There are roughly 260,000 disputes for an aggregate tax demand of Rs 4.37 lakh crore, according to the finance ministry. Out of them, 223,000 cases are still pending with tribunals and the disputed amount is a staggering Rs 3.84 lakh crore. "It will unlock money for the government and also allow it to improve the environment for business," says a former revenue secretary. Recapitalisation of banks could also be high on the priority list of the government. Stressed assets of Indian banks amount to 10 per cent of total bank loans. According to Reserve Bank of India (RBI) estimates, the total quantum of stressed assets, that includes non-performing assets, is about Rs 10,00,000 crore. There is a possibility that the government might set up a fund that buys out stressed assets of banks, freeing them up to lend. The UPA government had allocated Rs 11,000 crore for bank recapitalisation in the interim Budget for 2014/15, lower than the Rs 14,000 crore in 2013/14 and further allocations are unlikely in the revised 2014/15 Budget. State-owned banks could be encouraged to raise capital from the equity markets. Some 86 per cent of NPAs are with state-owned banks. 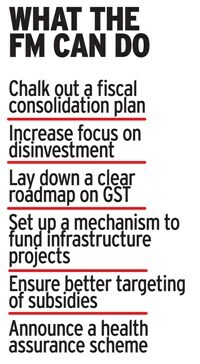 A clear roadmap on the Goods and Services Tax (GST) is expected to be presented in the Budget. There is also an expectation that the Modi government could compensate states for the losses incurred on implementing GST - Chidambaram had also compensated states in 2004 for revenue losses after switching over to value added tax. However, this Budget is unlikely to account for the compensation costs. Several top bureaucrats say the PMO is keenly pushing for a national health assurance scheme in the first Budget itself. The new scheme, a bureaucrat says, is designed to focus on wellness of citizens (this scheme will have a cap based on household income). "This scheme is close to the PM's heart. This will provide universal health care, which is not only accessible but also affordable," says a bureaucrat. It is expected that this new scheme will be integrated with the National Rural Health Mission. This was one of the poll promises of the BJP. There are several BJP-run states which are already running similar schemes. Modi had also started two schemes in Gujarat on these lines. On the possible impact of El-Nino on India's farm sector, Anand Mahindra, Chairman and Managing Director of automobile giant Mahindra and Mahindra, had recently wondered on social media whether India could 'weather-proof its economy'. Irrigation and better water management have often been showcased by Modi as among his stellar accomplishments in his home state, and in all likelihood will find prominence in the Budget. "Many regions in the country have a shortage of water. It is well known that drip and canal irrigation significantly improves productivity. It is likely more funds will be allocated to these two areas," says Ajay Shriram, Chairman and Senior MD, DCM Shriram, a diversified business group with interests in agriculture. Usually governments tend to go into silent mode before the Budget. But the Modi administration, while quick to issue a gag order to ministers and bureaucrats, has effectively used media to issue clarifications on policies and to spell out its broad policy direction in the weeks leading to the Budget. In a hurriedly called press conference outside North Block, Finance Minister Jaitley announced that excise duty relief for auto makers will be extended till December 31. The relief was to lapse at the end of June. A rail fare hike was also announced nearly a month before the Budget, and indications that defence would be opened up to FDI were given even before the government was formed. It's apparent that there will be a increase in Budgetary allocation for the defence sector from 1.73 per cent of GDP. Rahul Chaudhry of Tata Power SED, a company involved in defence production, is hopeful that FDI will lead to the much-needed modernisation of the defence sector. "Increasing capital spending, or putting a cap on revenue spending can strengthen and modernise the defence forces," says Chaudhry. Meanwhile, Modi nearly complained in his letter on the completion of first 30 days of the NDA government that allegations against him began in the first 100 hours of taking office. "Every new Government has something that friends in the media like to call a 'honeymoon period' ? Not unexpectedly I don't have any such luxury," he wrote. While Modi is aware that he does not have the luxury of time, he is also making sure that his team of ministers clock in the hours. He is known to call his ministers on their landline first to check if they are in office. Modi is also known to make surprise visits to the offices of his staff. Every effort is being made to ensure accessibility and accountability in the operations of ministries. Whether the Budget too will reflect some of that commitment remains to be seen.